"Really, how can little shiny beads strung together help someone communicate with animals? Immediately though, as I placed the bracelet on my wrist, I felt a soothing, grounding feeling, along with my heart and third-eye move into an expanded state. THESE CRYSTAL BEADS DO INDEED ACTIVATE YOUR ENERGY FIELD INTO A PLACE OF RECEPTIVITY. My confidence increased, I relaxed deeply and the ease of communicating with the animals was effortlessly available." ♦	Do you ever wonder what your animal companions are trying to tell you? ♦	Do you wish there were a better way to let your animal friends know what you want? This genuine chrysocolla gemstone, Swarovski crystal and 14k gold-filled or sterling silver bracelet has been lovingly handcrafted and energetically cleared and infused with blessings to enhance your communication with animals. This bracelet receives and transmits divine energies to assist you in your desire to communicate with animals. It may enhance your existing abilities or open up your capacity for communication. You may experience stronger relationships and a deeper understanding of each other. Communication may come in the form of feelings, telepathy, or images. Experiences will vary, according to how open you are to receive this gift. This bracelet may also enhance the energy of your intentions to communicate with your animal, so that they can receive your messages to them with more clarity. Chrysocolla is known for its assistance in communication and divine expression. Chrysocolla emanates gentleness and power. It is a stone of gentle harmonies, and will allow the wearer to express themselves to others purely from their inner soul. This stone will assist you with difficulties in communicating, shyness, and trouble with expressing emotions. It harmonizes the energy of God and Goddess and brings it into alignment. Our intention for the animal collar charms is for them to bring divine energies to your companions for the purpose of alleviating their fears, anxiety, and health issues. The charm can assist them in grounding and releasing unneeded energies that they take on for us. They also work in conjunction with the bracelets to enhance communication. This bracelet has been programmed to adapt to your individual needs, and will continuously receive unlimited sacred energy. The energy will never "wear out," and the bracelet will not absorb any negative energy, so it never needs to be energetically cleared or recharged. If at any time in your journey, you are knowing or sensing that you are not experiencing all that is possible, you can choose in every moment to release the blockages and allow yourself to receive. COLOR: Chrysocolla, Smoked Topaz Swarovski Crystal, Crystal Golden Shadow Swarovski "Devoted 2 U" heart charm and Sterling Silver or 14K Gold-Filled. All gemstones are unique, and color can vary. 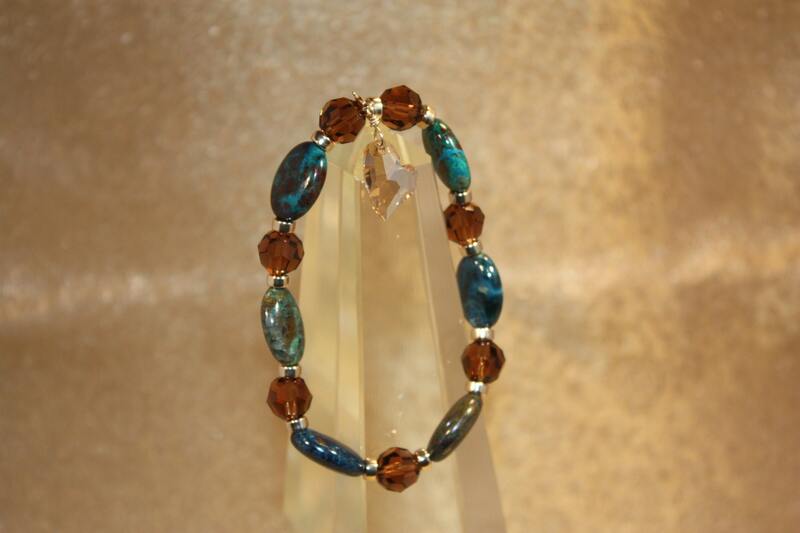 SIZE: Crystals are 10mm, Chrysocolla beads are 13 x 18mm flat ovals. Swarovski "Devoted 2 U" heart charm is detachable. Please select 7", 8", or 9" size. Design may vary somewhat based on size. Pictured are 8" gold, 7" silver, 9" gold, detachable charm detail, and packaging. Length is linear, please allow for depth of beads. Stretch cord for ease. PLEASE NOTE: Crystal Vibrations Jewelry is not responsible for the behavior of your pet or any other animal. We are co-creators with God/Universe/Creator/Divine Source... in the production of these jewels. We clear, assemble and infuse the bracelets. God supplies the energy and the potential. Our intention in creating these jewels is for them to bless and enhance your life. How that manifests for you is in accordance with what you will allow yourself to receive, and between you and God.